This house has already had some work carried out on the ground floor but still benefits from the traditional feeling that has been very well maintained on the upper floor. On the ground floor, there has already been some work carried out. New plumbing has been installed as well as double glazing. At the moment there are no divisions apart from the one bedroom and bathroom, the bedroom has cork flooring. The rest of the space has been converted into open space living and dining and the kitchen has an open fire place. On the upper floor there are three bedrooms, all of a good size and all of them have a set of double doors which give access onto a large balcony with exceptional views over the countryside. Two of the bedrooms have fitted wardrobes. All of the upper floor has parquet flooring which has recently been restored and varnished. The bathroom is functional although would benefit from a new and more modern one. All of this floor is perfectly habitable and has been painted recently although, depending on personal taste, it could do with some basic modernization work. 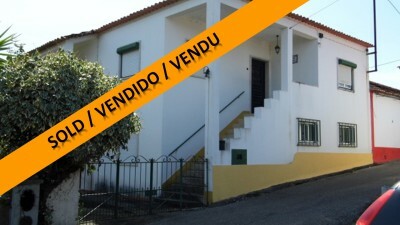 The property has a large plot of land measuring around 5198 sqm. The land has various fruit and olive trees and there is also a well. The house also comes with another three plots of land which has an annex included. The property is around 4 km from Serra which has all basic amenities such, a doctor’s surgery, post office, restaurant, various cafés and an ATM. The larger town of Tomar, which is home to the UNESCO listed Convento do Cristo, is around 12 kms from the property.